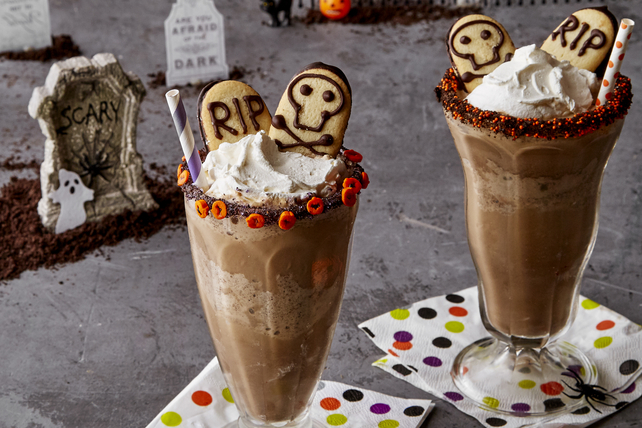 Take a coffee shake to the next level with this festive Halloween recipe. Each Halloween Coffee Shake is cool, creamy and spook-tacular! Pour 3/4 cup coffee evenly into compartments of ice cube tray. Freeze 4 hours or until firm. Meanwhile, spoon melted chocolate into small resealable plastic bag. Cut small piece off one bottom corner of bag; use to decorate oblong milk chocolate-filled cookies to resemble gravestones as shown in photo. Let stand until firm. Add remaining coffee to blender along with the ice cream; blend until smooth. Add coffee ice cubes; blend on high speed until thickened. Add 3 Tbsp. cookie crumbs; pulse just until blended. Set aside. Combine remaining cookie crumbs with sprinkles. Dip rims of 2 tall glasses, 1 at a time, into ice cream mixture in blender, then into crumb mixture, turning to evenly coat rim of each glass with each ingredient. Fill prepared glasses with remaining ice cream mixture; top with Cool Whip and decorated cookies. Serve immediately. Enjoy a serving of this indulgent treat, but keep portion size in mind.